I've just completed my first attempt at vegan cooking ... and it wasn't so bad. I found it's like cooking vegetarian, but also forgoing cheese and butter along with the meat. 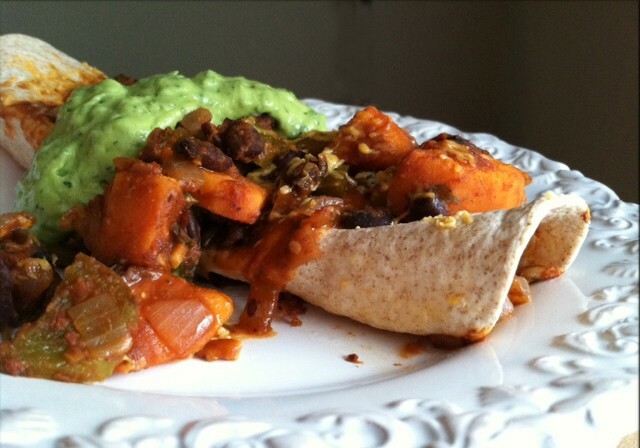 The recipe for these vegan enchiladas with avocado cream comes from the blog Oh She Glows. Stuffed with a filling of cooked sweet potatoes, spinach, black beans, onions, and bell peppers, these were sort of like baked burritos. They are healthy, they taste that way. They're not something you gush about how spectacular they taste. They're simple ... and that's OK because sometimes you just want it that way. I'm not sure if I'd make the enchiladas again, but the avocado cream served on the side is a keeper. Who needs sour cream when this avocado stuff is just as creamy and is so much more flavorful? Get the enchilada and avocado cream recipes here on Oh She Glows.